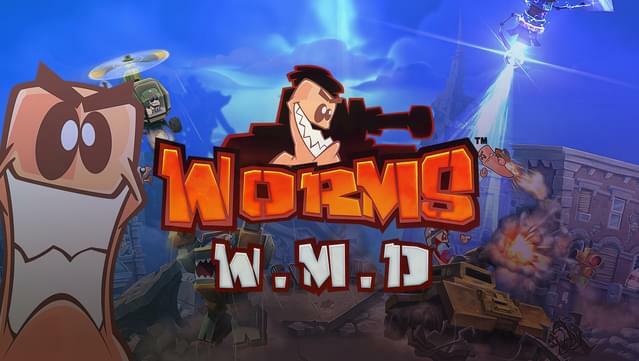 Worms W.M.D includes the Worms W.M.D All-Stars Pack, featuring an army of guest stars from some of the hottest games around, including Goat Simulator, Broforce, Saints Row IV and many more! 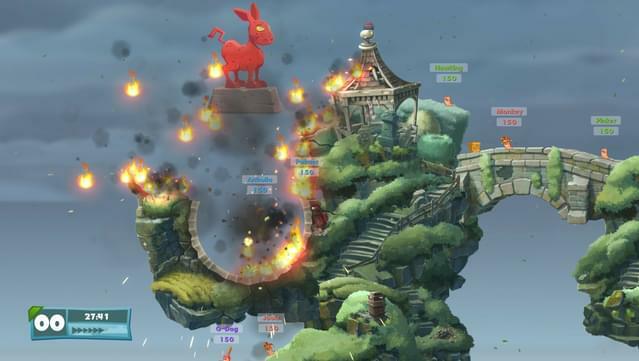 Wonderfully 2D - The best implementation of the Worms formula yet, now with a brand new worm, and gorgeous digitally-painted 2D artwork. 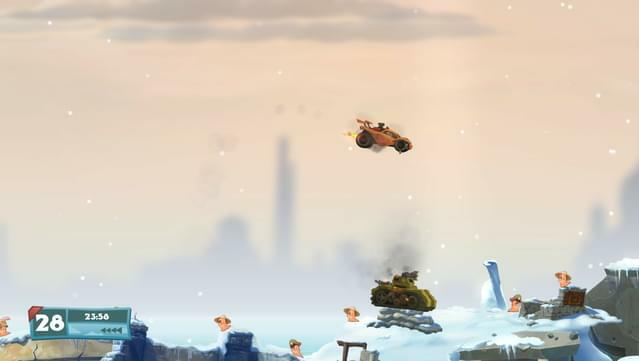 Vehicles – Worm warfare gets serious with the introduction of vehicles for the first time in the series. 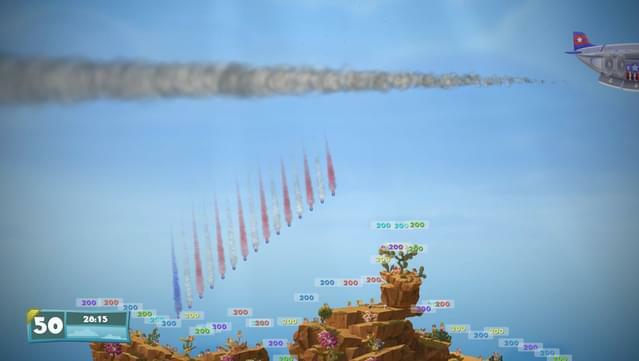 Dominate the landscape in warfare-ready tanks, take to the skies to unleash hell from from above in helicopters and more! 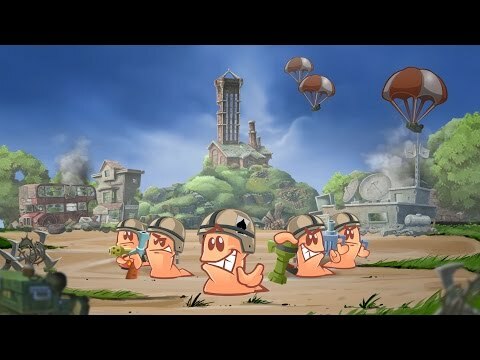 Buildings - Gain the tactical advantage by keeping your worms’ heads down and hiding out in a building, protecting them from direct attacks! Crafting – No more waiting around while your opponents take their turns! 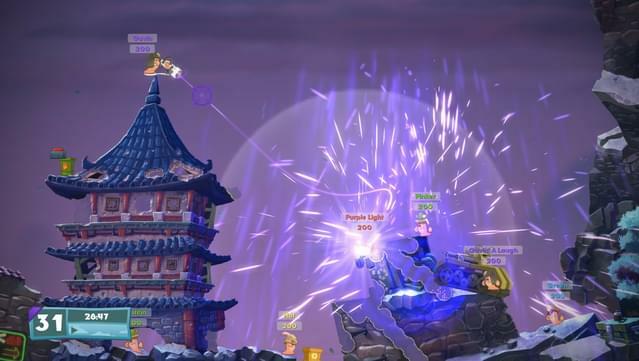 Grab the crafting crates that drop from the sky during games to make fiendishly upgraded versions of items such as the Electric Sheep, the Bazooka Pie and the Holy Mine Grenade to unleash on your enemies! 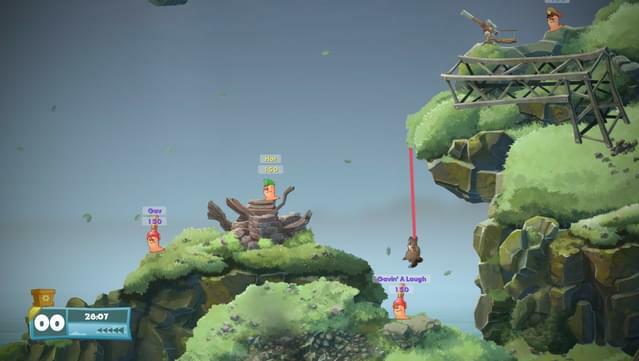 Classic Worms Physics and Gameplay - Our brand new engine recreates the feel of the fan-favourite entrants in the series; and sees the reintroduction of the much loved Classic Ninja Rope. New and classic weapons – Over 80 weapons and utilities at your fingertips, including many returning classics and a slew of new additions such as the Dodgy Phone Battery, the Unwanted Present and the OMG strike. 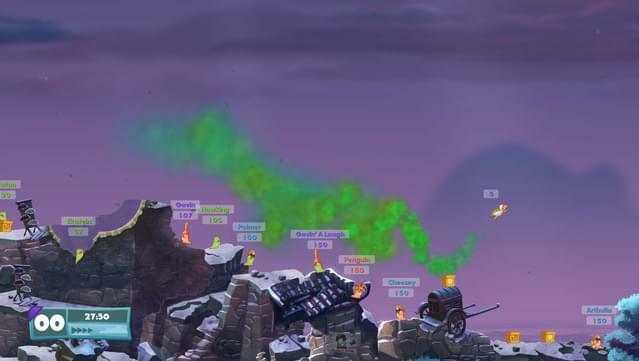 Mounted Guns - As if 80 weapons and utilities wasn't already enough! 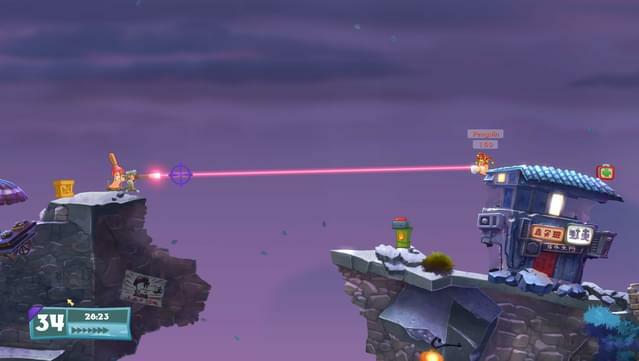 A range of different gun types are placed around the landscape, allowing your warmongering worms to do even MORE damage! 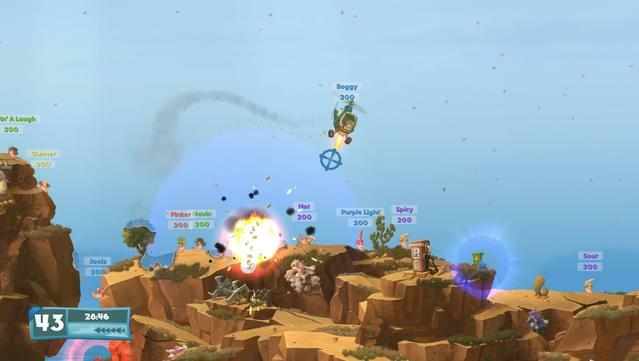 Hilarious single player plus online and local multiplayer warfare – Worms W.M.D comes locked and loaded with a huge arsenal of Training Missions, Campaign Missions and Challenges for the solo player. 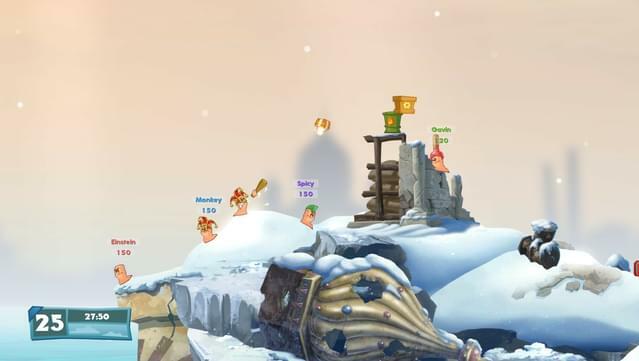 Train up then head online to create havoc in multiplayer modes including ranked play, with room for up to six players with eight worms each on a map! Multiplayer Notice: Multiplayer is available only between GOG.com users and requires GOG Galaxy Client. 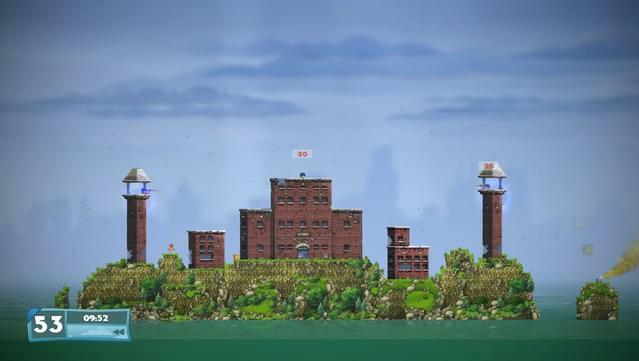 Team17 Digital Ltd. / Team17 Digital LTD.